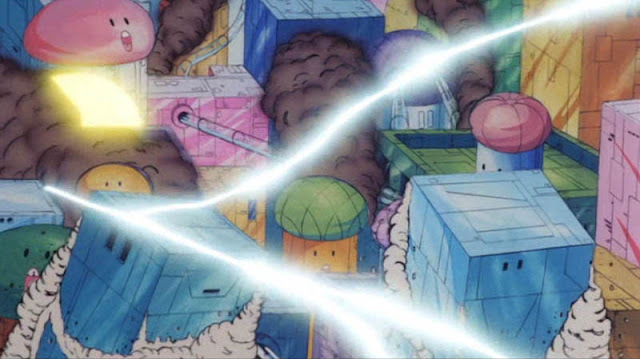 Akira Toriyama kickstarted the 80s with a one-two manga punch of (1) wonderfully round cartoony characters squirrelling around a fully realized universe of pint-sized automobiles, fat little sunglass-wearing pigs, and the simple yet busy landscape of the best Richard Scarry book ever, and (2) poop jokes. 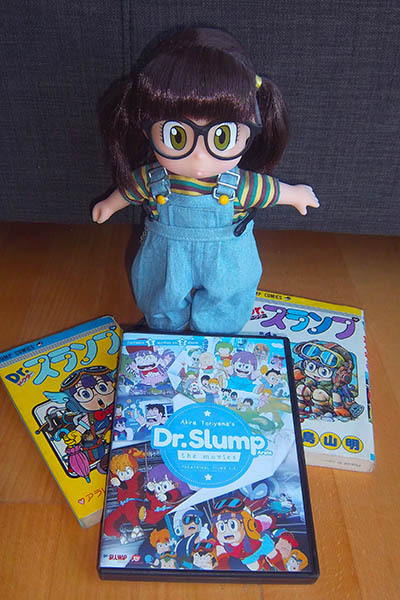 Premiering in January 1980's Jump, Dr. Slump was an instant hit, winning awards, making an ink-stained superstar out of Toriyama, being collected into 18 tankubon collections, and starring in 284 episodes of TV anime from Toei on FUJI-TV. Oh, and eleven films. As an 80s anime nerd I knew of Dr. Slump thanks to Ardith Carlton namechecking the show in her seminal Comics Collector piece (Summer 1984 issue); soon afterwards I spotted the first tankubon on sale at the local Japanese grocery store, at a nostalgia-inducing yen-to-dollar exchange rate. It got got before you could say "N'cha!" and even though I couldn't read enough Japanese to find a toilet, Dr. Slump featured plenty of toilets and toilet humor and lots of other goofy SF comedy, universal enough to get laughs around the world, and I was a Dr. Slump fan but good. Viz would later publish the Slump manga in fine English editions, but apart from subtitled Japanese-language TV broadcasts in North American cultural markets and an abortive Harmony Gold pilot, Dr. Slump's animated output wouldn't get a proper English release until 2014's Discotek Media release of the first five Slump films in a two DVD set. Which is what we're talking about here, Akira Toriyama's Dr. Slump (Arale) The Movies. 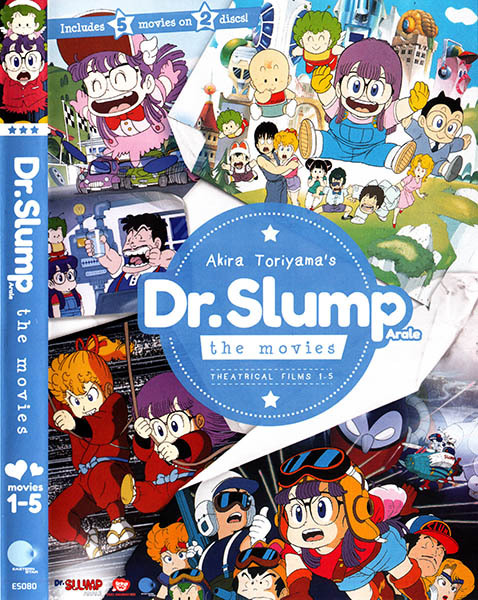 These Dr. Slump films all feature our Dr. Slump heroes; the inept genius Doctor "Slump" Senbei, his creation the super-robot girl Arale, Arale's inhuman toddler pal Gatchan, Penguin Village juvenile delinquents Taro, Akane, and Peasuke, and their glamorous, slightly scatterbrained teacher Midori Yamabuki as they deal with making demons cry to create love potions (the secret ingredient is boogers), racing around the world with marriage as the prize, being kidnapped by the mecha-wonderland Mechapolis, escaping the clutches of the evil Black Dragon Society somewhere in the 1930s, and outwitting Senbei's arch-rival, the insane super genius Dr. Mashirito, as he bends time and space itself for the hand of the lovely Midori. Filled with secondary and tertiary characters, these Dr. Slump films swarm with cameos by Ultramen, kaiju, Star Wars stormtroopers, droids, and aliens, as well as more familiar faces like Soramame the Clint Eastwood inspired barber and the inept, hateful "superhero" Suppaman. 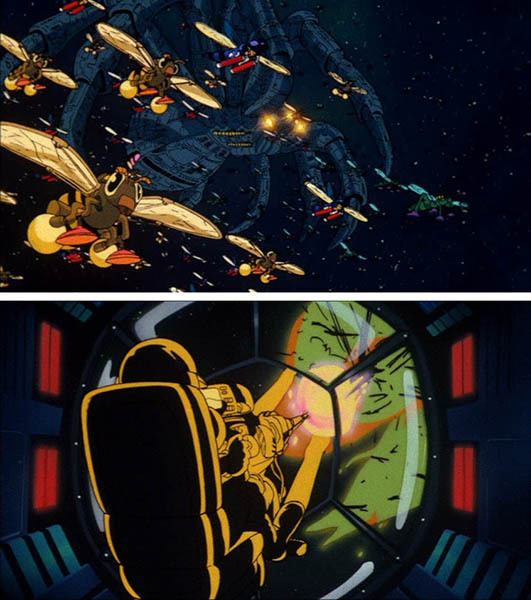 Mashirito's star turn is in Space Adventure, the best film of the bunch, which brings the full power of Toei's SF animation department to bear on bringing this space opera to thrilling, laser-blasting, star-destroying life. Midori's secret life as alien royalty is revealed and Senbei launches his own outer space battleship into the galaxy to rescue her from a fate worse than death, which is to say life with galactic emperor Dr. Mashirito, voiced by Yasuo "Lupin III" Yamada, taking the insane space dictator / momma's boy role to new heights of glam rock weirdness. Lampooning Star Wars and Arcadia Of My Youth in equal measure, Space Adventure is required viewing for anyone who's watched Be Forever Yamato, Towards The Terra or Queen Millennia and wondered what those movies would be like with more jokes. I know I have. The Great Race Around The World is just as satisfying; yes, it's Wacky Races, Dr. Slump style as everybody takes to the open road in a wide variety of improbable vehicles, taking an erratic route around the globe with the hand of the beautiful Princess Front of the Radial Kingdom – who, strangely enough, bears a startling resemblance to Midori Yamabuki – as the prize! Will the evil Dr. Mashirito and his evil supercars defeat our heroes? Will Princess Front be forced to marry someone she can't stand? 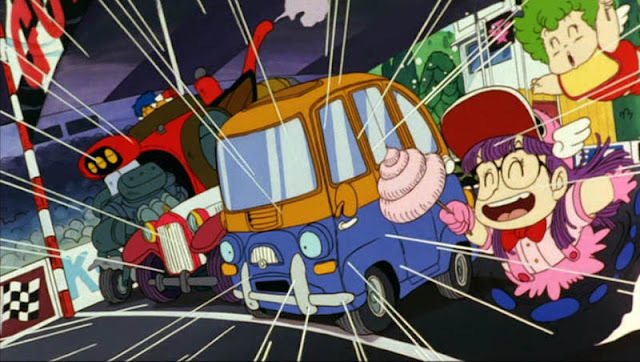 Will Dr. Slump's depressed kei-class minivan stave off crippling self-doubt long enough to carry Arale across the finish line? The City Of Dreams Mechapolis is a curiousity; light on plot, it screens like it was poured right out of the wishes of its ten year old target audience. Penguin Village's kids are all sucked into outer space to Mechapolis, a mechanized-planet wonderland Disney World even more robot-filled than the actual Disney World, where everyone's dreams come true thanks to robots. Its hazy futurism recalls other dazed and confused anime masterpieces like, say, Noel's Fantastic Trip, and the addition of a painfully long scene involving closeups of Peasuke's prepubescent junk moves from comedy to cringedy with remarkable speed. 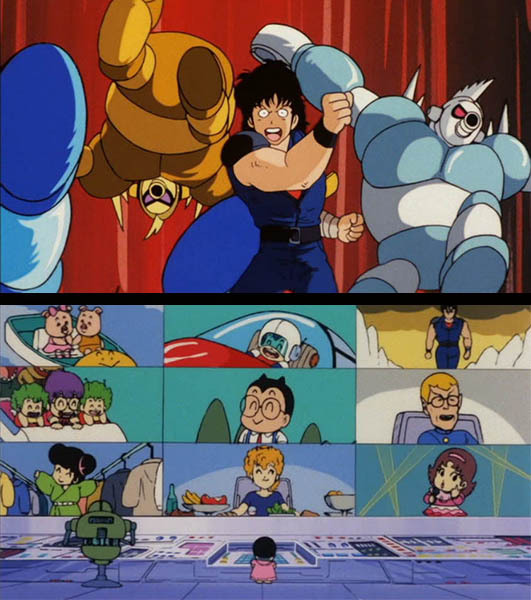 Luckily, our peek into the childrens' id helps the film recover its humor and we're treated to all sorts of robot-enabled dream scenarios, including idol singing, riding on rollercoasters until you puke, eating lots of food, zapping spaceships, and cosplaying as Ken from fellow Toei anime series Fist Of The North Star. 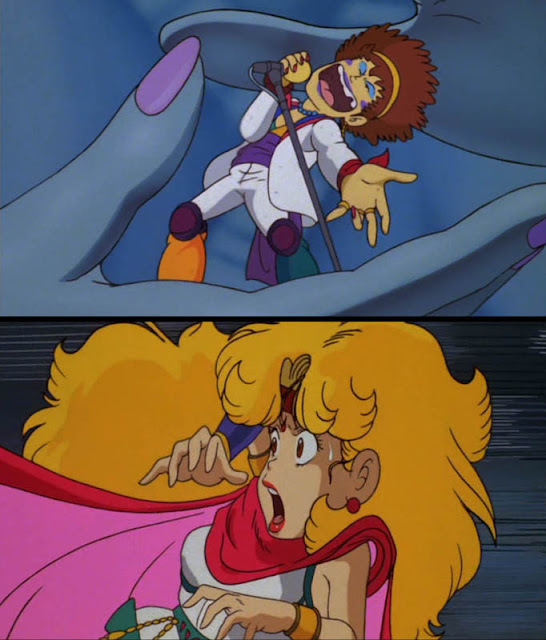 When the surprising ruler of Mechapolis decides to turn this wonderland into a nightmare, things backfire and are only made worse by the addition of that universal Dr. Slump ingredient, poop. H.P. Lovecraft's "The Doom That Came To Mechapolis"
Hello Wonder Island is an expanded TV episode, itself an expanded manga chapter, in which Senbei journeys to Wonder Island to gather the ingredients for a love potion, the details of which are revealed to him on a videotape recorded by his late father, who knew Senbei would have trouble with girls. It's an earlier Slump story and you can see the characters settling into their roles and the show reaching its sweet spot in terms of crazy inventions and a sexually frustrated Senbei. The Secret Of Nanaba Castle, on the other hand, is late-period Dr. Slump, with all the signifiers that entails – the Tsun family, two Gatchans, and storylines that begin to resemble the episodic adventures of Toriyama's next series Dragon Ball. The action starts to overpower the goof as Arane and Akane, embedded in a fantasy 30s' Indiana Jones setting as the Hoyoyo Gang of Robin Hood style ninjas, steal not only sweet potatoes (as seen in the original manga story) but an amazing wish-fulfilling gem called the Rainbow Eye from, who else, the dapper millionaire Senbei Norimaki. Their midnight theft is hijacked by the evil super genius and zeppelin enthusiast The Great Bisma of the Black Dragon society (of Count Dante fame, obvs). The Hoyoyo Gang, Police Detective Taro, and various Penguin Villagers endure aerial battles, submarine adventures, and a lava-filled confrontation with the Genie Of The Rainbow Eye in their quest to recover the gem and fill 45 minutes of a film that, in spite of its action trappings, feels longer. Discotek's two-disc set looks great, is only occasionally doing a little judicious zooming to turn some of the non-anamorphic films into HDTV-friendly widescreen, and you get all five films with English subtitles and trailers for each of the movies, perfect for dropping in before a screening of a more serious 80s anime film. Which was most of them. As an antidote to Japanese animation's 80s aesthetic, which, let's face it, was heavy on long, draggy films full of planetary destruction, brave sacrifices, and Kitaro music, these Dr. Slump shorts are guaranteed filled with laughs and pep. Not to mention poop.